When the kids go shopping with dad, I can always expect a surprise (/shock)… Sure enough, during one of their outings to the mall, they came back with a pack of ready-to-mix cheese balls. For once, that was a pleasant surprise. We were all eager to try it (thinking of the crisp-outside-gooey-inside cheese balls in Italian restaurants!). 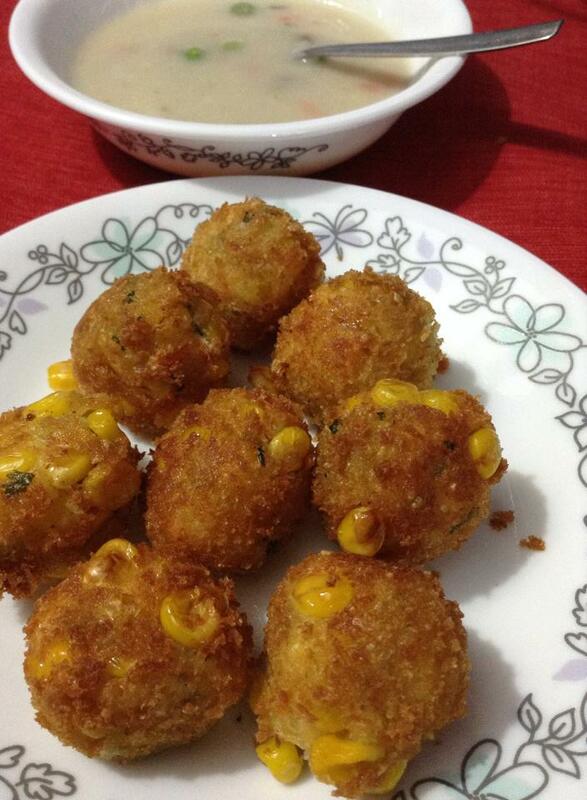 With lots of expectation, I rolled the powder mix into balls, coated them with bread crumbs and deep fried in hot oil. To our BIG disappointment, the cheese balls failed to impress us except for their looks. The texture and taste were not what we expected at all. Even the kids gave a bored look the moment they had a bite. So I had to promise them that I will make real yum cheese balls very soon. I googled it, and found a recipe that was simple enough to follow, but it seemed to include white sauce. To reduce the chance of one more disaster (shock! ), I tweaked the recipe to my preference and taste, and, what do you think? It was a SUPER DUPER hit!!!!! So here goes the recipe…. Cook the corn in a pressure cooker or microwave oven by adding a pinch of sugar. You can skip the sugar if you want to, but I’ve found that it really brings out the sweetness (and therefore, the flavour) of the sweet corn. Separate the corn kernels and run them in the mixer/blender just for a second or two. Ensure that it doesn’t get mashed. Take the blended corn kernels in a bowl and add the other ingredients. You can add more corn flour depending on the moisture content. Mix well and shape them into small balls. Make a thin paste of corn flour and water. Coat these balls with this mixture and roll it over the bread crumbs*. Repeat process for all the balls. At this stage, you can choose to store the balls in the freezer (for up to a day or two) before deep frying. Even otherwise, refrigerating the balls for a minimum of half an hour would make the crumbs stick nicely and give a beautiful golden brown colour to the balls. Heat oil in a pan and drop them a few at a time. Do not disturb them for a while till they start browning. Then turn them around till they get an even browning. And lo, you have absolutely crispy, yummy cheese balls that kids will really drool over and ask for more (mine did, at least)! * you can make bread crumbs by freezing a couple of slices and running it in the mixer for a few minutes. Hygienic and fresh bread crumbs are ready to use in any recipe of your choice. Sweet corn is a whole grain variety which is used as a vegetable. Apart from being undoubtedly rich in fiber, it is also rich in carotenoids like Lutein and zeaxanthin. However unspellable these words can be, they can make you read better. Yes! They help in improving eye health and also have loads of other benefits like improving cardiovascular health. Recent studies are showing that consuming more of sweet corn might help in improving memory and also in cancer prevention. So, go ahead and include sweet corn in your meal and also make kids happy. Look for a bright, green husk with pale to deep gold silk (corn hair). Always go for ones with plump kernels. It is best to use sweet corn as fresh as possible. If you store them for longer periods, the sugar gets converted into starch and they lose their sweetness. At best, store them in a Ziploc cover along with the husk in the refrigerator for not more than 4 to 5 days. You can choose to boil, grill or microwave sweet corns. Remove the husk and silk covering the kernels. Break the cob in half and immerse in water for cooking. Cooking doesn’t take more than 3 – 5 minutes. The fresher the corn, the lesser time it takes to cook. Once the corn is cooked, keep it immersed in water till cool. This avoids the kernels from getting dried. Take out one whole row (line) of kernels with the help of a sharp edged spoon. The other rows of kernels can be easily separated by slightly bending and turning due to the space made available by the empty row. I always buy corn on the cob and cook it on microwave for 5 minutes on high. Adding a pinch of sugar while cooking helps to bring out the sweetness of the corn.